THEY'RE GOING TO BE LOVELY." exploited to the max, and lucrative deals had been made with big American hotel chains for prime real estate. All that was left to look forward to was high unemployment and increasing trade deficits. Jamaica gained its independence from Britain in 1962, only to find itself struggling with its legacy of slavery and colonialism. Michael Manley's Peoples National Party (PNP), with its socialistic attitudes of spreading power and wealth, provided a voice for this nation's dispossessed and acknowledged the nation's overwhelming African heritage as part of the new postcolonial Jamaican identity. 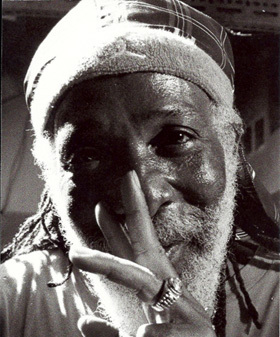 Roots Reggae formed the soundtrack of the Manley era. Meanwhile, the U.S. became increasingly uncomfortable with Manley's pursuits of opening diplomatic channels with Cuba. Manley's government ultimately collapsed from a number of factors including fluctuation in trade and social instability caused by a devalued currency. Travel agents discouraged their clients from going to Jamaica, thereby crippling the industry on which the island depended on for its survival. The cultural reawakening in Jamaica reflected changes in the world at large. Cultural and political consciousness was on the rise in many developing countries inspired by the nearby Cuban revolution and the civil rights and Black Power movements in America. All of this was taking place in a period when Africa was being revitalized in a diasporian consciousness, channeling cultural memories of African roots. From the teachings of Marcus Garvey, Rastafarians embraced the concept that Africa was the site of repatriation for a people in exile. Marcus Garvey said "Look to Africa when a black king shall be crowned for the day of deliverance is at hand." The Rastafarians interpreted the crowning of Haile Selassie of Ethiopia as the fulfilling of this prophecy. Considering Jamaica's long-standing economic hardships and the violence that accompanied its social change, it is no surprise that Jamaicans longed for another home. of its population. This massive migration inflicted wounds bearing a strong resemblance to slavery's forced partings and resulting in children growing up without fathers or mothers. This pain of separation has become a fixture in the island's soulscape. Trench Town, slums, and shantytowns were all that were left. It was in all this misery that Reggae grew. When Jamaica won its independence from Britain in 1962, political and cultural independence was still a work in progress. Large sections of the island's upper and middle class opposed, and continue to oppose, the use of the Jamaican language in favor of the "proper" English of the colonial "mother country" - Britain. colonizing language, and African, the language Africans brought to Jamaica through the Atlantic slave trade. This unique combination of English and African words tempered by the retention of African grammar and syntax was spoken with an accent similar to the rhythm of Mento, a Jamaican form of calypso, from at least the early twentieth century until the '60s. The bold, conscious use of Jamaica's rich language and folklore by Bob Marley and other Roots Reggae artists during the '60s and '70s represented a post-colonial identity for Jamaicans. the passions of her people's hearts preserved a foundation and provided building blocks inspiring artists to carry on rhythmic themes of liberation. This section of the exhibit is an overview of seminal artists, movements, their contributions to early popular Jamaican music, and Marcus Garvey, the champion of Black culture, and his profound influence on the Rastafarian movement. Count Ossie's drum ensemble with his distinct Nyabingi hand drumming and his influence on early Ska. Don Drummond's revolutionary trombone playing and the significance of his jazz-influenced improvisational approach on Reggae. My Boy Lollipop's Millie Small and other bold and influential Reggae sistas and mothers. U-Roy the Toaster and his contribution to Rap culture. 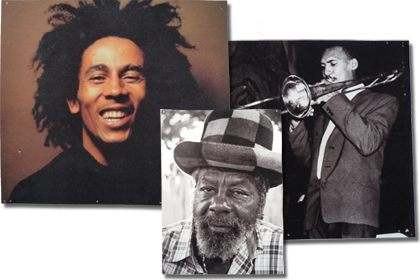 Bob Marley's artistry and poetic lyrics, which built on the above icons' influence and his music legacy on the Caribbean diaspora. The significance of the film "The Harder They Come" by Perry Henzell. Sound Systems - the model and the eternal litmus test for success. In the late '50s, Trojan Record’s founder, Arthur "Duke" Reid, drove Trojan brand trucks around Kingston with huge, refrigerator-size speakers blasting his innovative collection of Jamaican music. This led to the urban legend of how the name of the sound system and record label developed. Duke, who was a former policeman in the Kingston ghetto, maintained a "rough and rude" staple of villains for what he claimed was "protection," but in reality it was everybody else’s set who needed protection from his crew. Their main function was one of aggression: storming rivals’ parties, frightening off crowds, and smashing amplifiers and turntables. became Duke’s archrival and the two systems competed for audiences. It would be safe to say that any culture of violence associated with Kingston dancehalls can be traced back to these early days. A new language was created that remains intact today for this Dancehall culture. The rivalry was "a clash" where you would "mash up" or "murrrdah" the other system with wicked music at devastating volume. Showboating in flashy capes, Duke Reid would make an entrance with western-style belt holsters accessorized with cross bandoliers of bullets. He would fire into the air announcing his arrival. "Bullet, bullet, bullet " remains a powerful chant in Dancehall music of today. Most of the greats in Roots Reggae had a beginning in the early Sound Systems. Bob Marley worked for Sir Coxsome Dodd as a clerk screening records and telling Dodd which sounds to emulate. This was invaluable for Marley’s development as a recording artist and performer. Like the Trojan horse, these stealth sound systems were able to be in plain sight while changing the cultural operating system of the Jamaican world. Sound systems were portable discos, inexpensive mobile platforms for different experimental styles. Their nomadic nature remains unique to the Jamaican sound experience process. To reflect from a 21st century perspective, these early sound systems can be viewed as the predecessor of the iPod. During the ‘60s, early recordings of Jamaican folksongs called Mento music and the mobile sound systems of Duke Reid, Prince Buster, and Sir Coxsome influenced the distinct, danceable music called Ska. In 1964, Ska singer Millie Small's debut single "My Boy Lollipop" became the first international Jamaican hit priming the way for male Jamaican singers who followed. There is great significance to this hit. The irrefutable fact is that a young female Jamaican artist was the first to enjoy mainstream success. She was brought to London, England to record at Chris Blackwell's newly found Island Records. The revenue that this "fluke" (which it has been referred to) produced, gave Island Records the kind of profile in the British music industry that led to the signing of Steve Windwood and other major rock acts. This success eventually allowed Island Records to sign Reggae stars Jimmy Cliff and Bob Marley. Ska was relatively quickly displaced by Rock Steady in the mid '60s . American R&B, with its rich harmonies and emphasis on vocals, seduced Jamaica with its heritage of singing. Silky Rock Steady melodies with three-part singing trio structures allowed group of people to come together to sing. The ghetto had more singers because singing was what people did to pass time and soothe the spirit. American music that Jamaicans had adapted to island soul music. 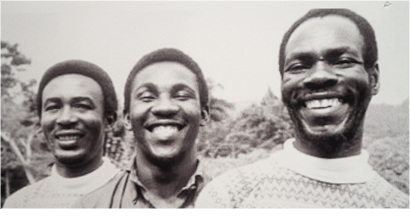 The arrival of Reggae represented a re-Jamaicaisation of the island's musical output with a far greater degree of nationalism than had been the case with Ska. A larger group of musicians were attracted to this new form for its vocals and Reggae's advancement was further precipitated by electricity. primitive and required a stabbing motion on the sticking keys giving Reggae its early jerky quality. By the early '70s, affordable studio equipment became available allowing better sound effects and greater acoustic range. Small studios were springing up everywhere trying to fill the great demand for new records. 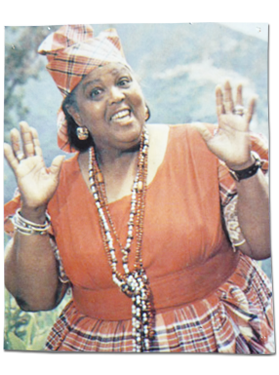 Immediately, a massive broadening of Jamaican music's scope of ideas was felt throughout the islands musicians. Reggae returned the Jamaican music to its people. The Roots period of the early '70s was a time when Jamaican music was taking on the world on its own terms. Economic conditions were at an all time low and unemployment was at an all time high. The ghettos were filled with the disenfranchised who had plenty of time on their hands to become more involved with Rastafari. It was believed in the Rasta community that this was a period of divinity; that circumstances conspired to prevent people from working, therefore enabling them to devote themselves to all things spiritual. "Exodus" album by Bob Marley and the Wailers was voted by Time Magazine as album of the century. Bob Marley song writer of the century. "One Love" song of the century. Dub music flourished during the Roots Reggae era. 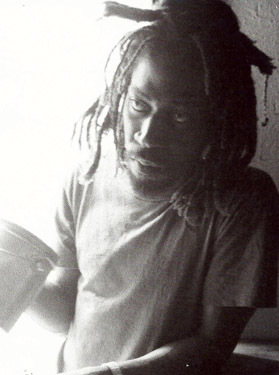 Dub's significance as a style lies in the deconstructive manner in which sound engineers remixed Reggae songs applying sound processing technology in unusual ways to create unique, new pop sounds. Dub marks a time when record producers and engineers became the new sound artists. nature with religious and spiritual conviction. Dub engineers brought a different attitude to Jamaican music. These new uninhibited, playful musicians recycled old Roots songs by fragmenting, removing narrative, and creating skeletal, reverberating soundscapes that left a structural uncertainty dependant on echo and reverb for form. It has been described as when good vibrations turn noirish. These new arrangements resonated with the age of the refugee and balanced on the edge of performance art. Shadows of popular themes existed in a musical graffiti creating sonic spaces and conceptual nuances that allowed auditory room for the "unspoken." Dub's acoustic experiment ventured into minimalism and created a new modernity reflecting the artists transition into technology and "rhythm science." released. Early recording pioneers in their studios with new technology and gleaming consoles conceptualized a laboratory, spaceship, temple, or shaman's hut. 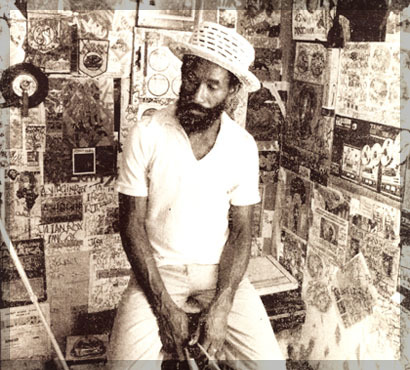 Lee Perry described his Black Ark Studio like a spacecraft. He could hear the space in the tracks … he was making space music. This new form played endlessly with mix. Artists such as Scientist experimented with building a mix on the instrumental tracks and letting them "bleed" onto other tracks. Most often a "bleeding" drum track was fed through a reverb unit, resulting in a spooky, alien sound that evoked images of drums being beamed from another planet or the vocalist existing in a world other than the musician's or even the listener's. This was all a creative response to the fragmenting culture these artists existed in. The new music responded to feelings of disenfranchisement compelling a response by retooling sound as a mystical weapon against creative extinction. Until 1985, Reggae music was characterized with a fat bassline. It was unimaginable that the musical form could exist without it, but true to Reggae's nature of always looking for a way to keep changing, King Jammy produced "Under Me Sleng Teng." The sound was an adapted rhythm from a simple Casio keyboard and proved to be a major creative watershed on the road from Roots to Dancehall. Not only did the sound launch King Jammy's career, but it liberated a host of sound artists from dependence on major studios. With a keyboard, sequencer, and drum machine, everything could be done at home. The incredible popularity of Sleng Teng changed the direction of sound stylistically, economically, and shifted a musical allegiance to technical ability rather than musical ability. From trade school backgrounds, Jamaicans were well equipped to become acoustic, electronic "tinkerers." Pumped up rhythms on drum machines fueled dancehall audiences giving Jamaica's dancehall a new techno flavor. AND I WILL MAKE YOU A UNIVERSE"
By the beginning of the 1980s, there was a generation of youth coming of age who knew little other than Roots Reggae and were aware that it was increasingly irrelevant to their lives. After a decade of piety and righteousness, the only economic, social, and political changes that had taken place were for the worse. Chanting down Babylon simply didn't work anymore. It was time to have fun and bring back a more sensual and "bawdy" element to the music. To do this, young Jamaicans reenacted a recurring theme of retreating from the existing musical trend that was no longer true to their conscious experience. To Jamaicans, Roots had become pop music that paid more attention to the western marketplace than the West Kingston sound systems. kept open and most importantly, that the music would stay in the dancehall and not move into the mainstream. With considerable assistance from technology, high speed mikes, "oinks," and "ribbits," gold-chained performers pushed producers to delve deeper and deeper into their new computers to find more challenging backing tracks: the antithesis to Root's culture. 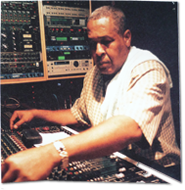 With the advent of Sleng Teng, the bassline had been removed, and producers such as King Jammy were duty bound to completely ditch the bassline and replace it with sheer volume and "in your face" impact. Early deejays such as General Echo, Eek-A-Mouse, and the incomparable Yellowman put the music right back in touch with the moods of the streets, in exactly the same way Dillinger and Big Youth had done ten years previously. Shabba, Ninjaman, and Tiger influenced incredible performances from Elephant Man, who believed in the importance of putting on a good stage show, exciting the audience, and keeping everybody on the vibes! But Dancehall too was to have many incarnations; the good vibes started with artists such as the albino Yellowman who would usually be shunned in Jamaica by everyone including family, but went on to become a mega star in the Dancehall underground. But with this kind of popularity, producers knew it was time to take it out of the dancehall and record it. music back in the hands of the artists, keeping their souls in touch with the process, and this still holds true today. When big acts such as the Stones or No Doubt need that extra dimension of soul, they come to Jamaica and seek out such artists as Bounty Killer to boost their music with the real Dancehall flavor. It is no surprise that the emergence of Dancehall Reggae reinstated Reggae into the mainstream without essential compromise. Jamaican music has made itself heard across the world to such a degree and with such apparent ease, that it makes you wonder why other music hasn't done so. Why? One word ... spirit.